In my previous post, I simulated some mechanical logic gates using a novel 3-bar linkage. Inputs , , must all produce the same output position. This time, I’m going to attempt to find the exact values to use for a given stroke, separation distance and output position. If it’s hard to read, then sorry! It was hard to write! is the output position. ( for the gate to function correctly. Thusly, one can calculate the input and output linkage lengths for any logic gate. These dimensions will work for an OR gate too, as the linkages are just reversed. It’s irksome that I couldn’t work out a symbolic solution for the last equations, especially since in the example came out to such a neat value. I might revisit this further in the future, and it’ll definitely come in handy when building something with these gates. This one slipped through the cracks – a Bubble Wrap Dispenser! The box is a gift box from the $2 shop, with a slot cut in the lid and fancy tape applied. The logos are some quick work in Inkscape, printed and cut from glossy paper. …was perforated on the laser cutter! I made a dashed line file, and cut the ~5m length of bubble wrap with littls perforations – just pull and tear, and you get a square of bubble wrap. Our cats love munching on greenery. OUR greenery! This should keep them away, but still allow the sun and rain in. Almost completed my DIY folding bed! Most folding beds are just wasted space and volume while folded up. Mine is cleverer than that; it’s a desk and shelf that transforms into a bed. As the bed folds down, the desk and shelf stay level, anything on them is undisturbed. Working well so far, more info to come. Another advantage of this design, I think, is that when the bed is open there’s no gap between the bed and the wall. Many folding beds have this gap, and need a panel anchored to the inner edge of the bed to protect the user rolling down into the mechanism. How to fit a desk somewhere into the design, either that folds down with the bed (so as to end up flat on the floor) or that folds up out of the way before folding the bed down. How to fit a wardrobe into the space. The metal bed frame I’m using is 1900 mm tall. The thin IKEA PAX wardrobe is 500 mm wide. The *entire* room is ~2400 mm wide. So maybe I’ll need to figure out how to narrow the wardrobe slightly. How to get this all done before my sister-in-law comes to stay! It’s got a simple pulley system so it can be raised or lowered as necessary. 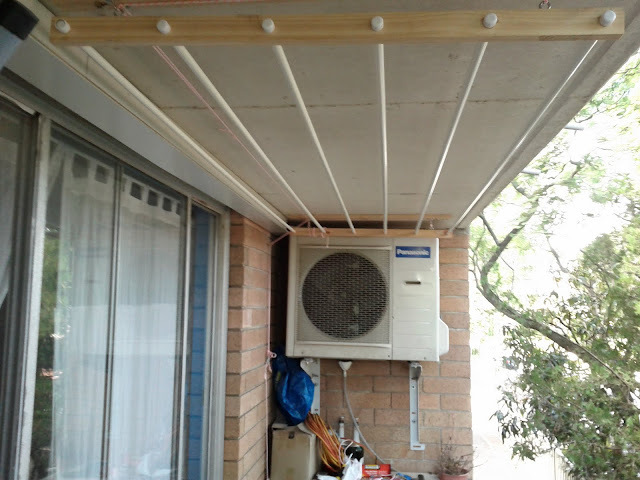 The rigid curtain rods stop anything from sagging or needing to be retensioned. 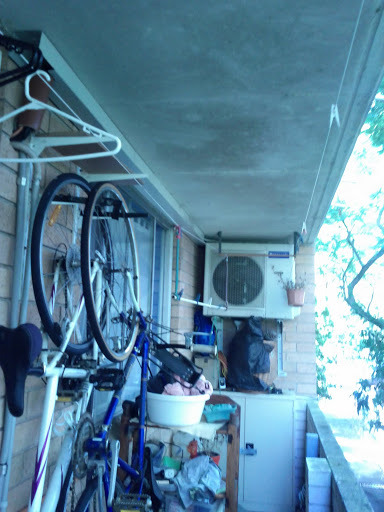 Total hanging space goes from ~12m to ~15m. 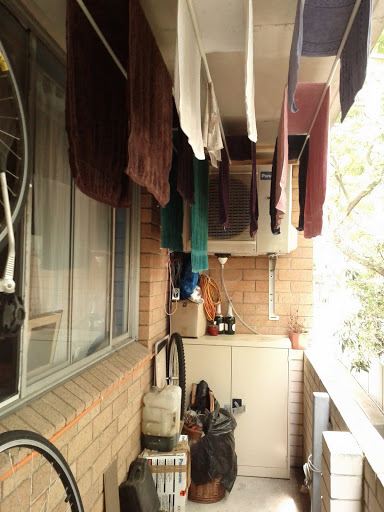 When ‘up’, the clothes are out of the way.